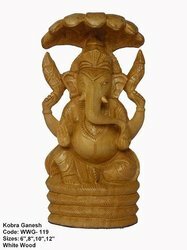 Our range of products include kobra ganesh statue, white wood ganesha statue, ganesha statue, sandalwood ganesha statue, lord ganesha statue and sandalwood decorative statues. Packaging Details: carefully packed in bubble papers and finally packed in a corrugated box. Enlighten your home with this auspicious statue of Lord Ganesha made from Sandalwood which reflects the artistic brilliance and adds elegance to your decor. 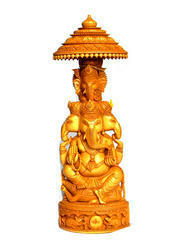 Style your home and office with this Sandalwood Ganesha Statue; sure to be admired by your guests. Placing this marble Ganesha idol in your puja ghar or living room will make the ambience pure and positive. 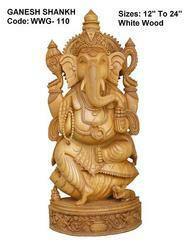 We present our clients a work of extremely high quality Hindu God Ganesha Statue. 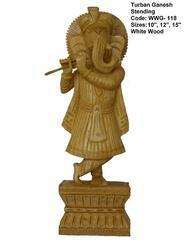 We also deal in God Statues, Sandalwood God Statues, Sandalwood Craft Items & Much More. Hindu God Ganesha Statue is the Lord of success and destroyer of evils and obstacles. 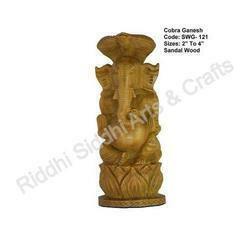 Sandalwood Lord Ganesha Statue is known to Bring prosperity and happiness in your home & Office. He is also worshipped as the god of education, knowledge, wisdom and wealth. 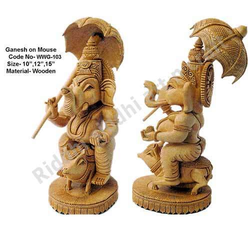 Features:- Made from Quality Wood and Sandalwood and Handmade in India. Spiritual Lucky Gift, Thanksgiving Gift, Anniversary Gift, Wedding Gift, Birthday Gift, Use Religious Gift, Promotion. This incredibly detailed Ganesha Idol Of Sandalwood Ganesh Statue For Home & Office has been wrought lovingly by the artisan and gleams with the richness of the natural finish that is imparted to this splendid idol. We are providing a Ganesha Statue. 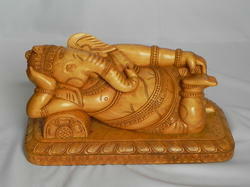 Divine Statue Of Lord Ganesha Made Up Of Sandalwood Especially For Office Desk Or Home Temple. It ? Can Offer A Graceful Touch To Whichever Place You Put It In.Beautifully Carved With Detailed Features. Packaging Details: Carefully Packed In Bubble Paper Finally Packed In in corrugated box.